A Divine Sign of Major Life Change. On Tone 1 we begin again in Unity. We Ascended with the Dawn of a New Awakening of our Spirit. CHICCHAN lit the fuse. As a catalyst of Spirit, we were able to See and Feel the Ether of our Identity. Our Ethereal Identity, “who we are” is not a tangible thing. The body is only a Place for a Time of residence by our Spirit. As we Wholly Identify as Spirit, we will be Transformed by a New Dream of Being. CIMI is with us to tend to a New Birth of Spirit created from a Dream we ALL share through a Vision of the Future. The Dreams that come True are the Ones we Love the Most. We ALL Love Love the very best of everything. CIMI guides a New Birth of Love. We will identify it like something we’ve never seen before. Like a Newborn, this is Love that will turn every head to see. This is birth that will arrive with Signs and Wonders. In a very small breakthrough of Light, we’ll see a Love that could complete ALL of our Dreams. Miracles are happening all around us all the Time. It’s a Light too bright to see it all at once. Through Signs, Wonders, and the Gift of Knowing we can. Imagine how you would be changed, waking up to Know you will Know every step to a Dream? What if you knew how dreams came true? What if you could see that the Divine Light that leads us, left a Trail of Light… that when we reach the end of the Light we Knew, from there, we’d know exactly what to do next? THEN, would you follow every dream you Loved? Through CHICCHAN we Ascended to the “Knowing.” Throughout the next 13 days, the first Spiritual Gift it will awaken is our Clairvoyance, a Gift of Seeing the Future. We were given the Eyes of Spirit to See it, by Believing in our own Dreams. When we Know they are going to come true, Knowing the future is easy. Reed/BEN gave us the Place to Go where we can Know through the Creator’s Light of Love, and through the Light of a Divine Family. We will be Reborn into a Divine Family, all capable to Create their Dreams. The Divine Child we dreamed to be would be Born Knowing from the Beginning. From the very start, we’d already know without any climbing. We’d look up from the crib at the faces looking back and Know we Knew Together. The threads of Love between us would be visible. We’d already see the Ties that Bind us together as One. We are Reborn through Knowing. All the Dreams given are things we could See, Acknowledge, and Know. 4th Uinal: Stability – The CIMI trecena carries us through to a Divine Truth that will anchor all our dreams by a Vision of Truth sent as a Lightning Flash from above. Worldly illusions will be seen for what they are, and swept away. We’ll see the Light in all 4 directions. Our Ascension planned from this beginning is 13 Flint/ETZNAB, a Truth as sharp as a knife will Open our Heart to Love. Peak Days of the trecena mark significant experiences of Spiritual Growth, offering the energy and momentum for Peak Performance. 6 Monkey/CHUEN – will establish the momentum for creation. CHUEN will help us discover the power we hold to recreate the world. 7 Human/EB – will Balance the Dream Above and the Believing Below in the Divine Destiny that was created for Humanity. 8 Reed/BEN – will Transform us through the Holy Light from Above, and through the Light we will see in Humanity. 9 Jaguar/IX – through a Truth of Spirit, Jaguar footprints will lead to a Divine Perception of us All. We’ll Know the Song of Love we sing together as the One Song of Love in the Universe. A Transformation will be completed through our Gratitude for each other that will REVEAL a future we never saw so clearly before. 1 Transformer/CIMI is leading us to 13 Flint/ETZNAB where a very Divine Truth about it all will be Realized at an altar in Direct Communion with the Creator. What we see can sweep our Human heartaches away. Human Love Transformed to Divine Love will forever change the way we see our Self and Each other. We will be reborn through the Consciousness of Divine Love. 1 Transformer/CIMI begins a new Season of the Tzolk’in. We’re taking on our identity as a sprout with leaves that help us see it. We’re in a season of our adolescence where we are beginning to look like adults, take on the critical thinking skills of adults, and the new strength to grow to maturity. This Season of 65 days is guarded by 13 Dog/OC, representing the Ascension of Unconditional Love. This is a season that prepares Human for the creation of a Family. Jen, our K’iche Day Keeper friend in Guatemala shed some light on this season through a Holy Cross reading. It’s a time of Resolution – finding our own way. In the beginning, we lived by all our parents truths. Now we’re starting to question them. They left truth from a perspective that we have to resolve to find our own Truth. What looks like a breakdown of family values is really a Divine Breakthrough. It’s the Miracle that parents Dreamed, that children would grow up to make their own way. We were just so sure it would be Our Way. Now is the time to Celebrate All the ways of our children because it’s part of finding their way. Parents have to have Faith in the Love given to stand on its own to reflect its own Redeeming Value with Time. We move on to grow into an adult THROUGH the experience of our own Family. But, that’s another season. 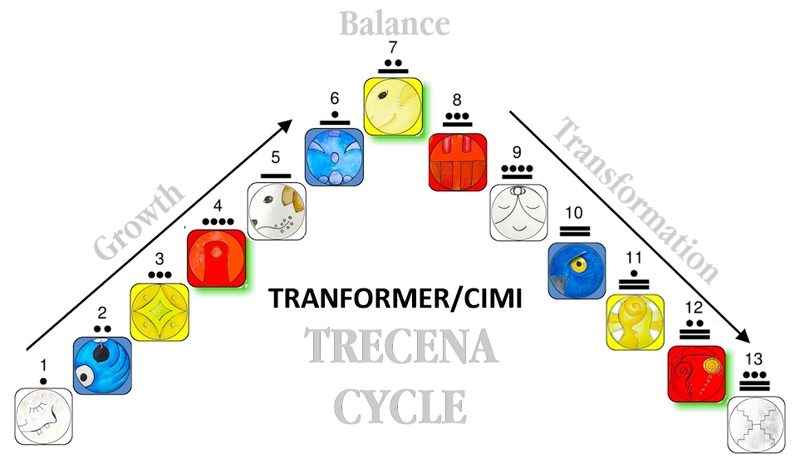 The Transformer/CIMI trecena is a cycle of “dark.” The Ascension of each trecena is built on the last. Reed/BEN was a cycle of “light” that represented incoming Light of a new inspiration. Now a cycle of “dark” completes the Wisdom through an application of what we learned. We will learn the realities of Family Love as Human carries the inspiration into a life experience. Dog/OC is leading to a Revelation of Love. This is the Day One of a new Dream we carry into the Light of Day. We can reset an altar to Family. White could reflect the Wisdom we dream by Intention and the Wisdom we can learn through the innocence of children. We could count our Self as a new child of Light, born from a new Seed of our Self. 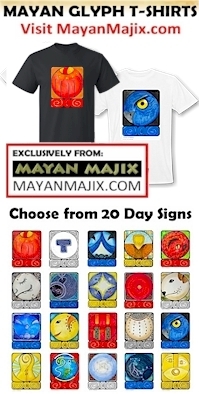 On my first round of the Tzolk’in’s 260 days I made a commitment to treat every Day Sign and Kin the same. The first day of the journey, I lit candles to the 4 directions, burned sage and sweetgrass and painted the glyph. When I did one, I realized the only equal thing to do was honor each one the same. It was difficult, but at the end of 260 days there was no doubt in my mind that I had paid my dues to each one. Completing 4 rounds, my thoughts returned to that same idea and I resolved a better way, one that would offer a provision for human limitations. Whatever I did on any day, would be Intended to honor 260 days. The Elders say, “There’s many ways to accomplish the same thing.” After walking with Reed/BEN that drew our family together, I’ll do the same, by recognizing the 260 as all of us – the whole family – on every trip to the altar. Transformer/CIMI marks some chaos. A family was born. Now we have to birth our Self into maturity. This is a very important time to remember that things don’t always appear as they seem. We may think we know it all as teenagers, though the fundamental skills to “know it all” are just beginning. We can relate by remembering how confusing life may have been for us back then. The parents we respected, the ones we turned to, suddenly appear to have everything wrong. We had no idea of the reasons they did what they did. Mostly, they seemed like spoilers for the party we had planned. They had it in for us. We only saw discipline and struggled to define it as Love. HAPPY VALENTINES DAY! Will you be my Valentine? Today is a day to Honor the Dog, the Unconditional Love that is standing guard at the door to our Family. Tone 1 is the day of Divine Inspiration, an Idea for a Dream, and a Vision of Love we can hold onto for this journey. Tone 1 is a day to be Here and Now with Love. Transformer/CIMI demonstrates a way. CIMI is the one that brings comfort through the gift of seeing the future. CIMI never leaves our side when we are going through the chaos of a Major Life Transition. While we are lost in the chaos, the “soft hand” of CIMI helps us know it’s okay to let go, because someone else is in charge who knows what to do in every moment. Today we can be inspired to be like CIMI for each other, so that whenever someone in our family turns to us in a crisis of chaos, they’ll see that we’re still there, Believing on their behalf. We will grow through the process of being Unshakable in our Faith. CIMI is laying down the foundation for the Stability intended by the 4th uinal of our experience. Be Here Now for the Inspiration to carry it out. Know that you are seeing the future, because you will believe in your own Divine Intention of Love. CHICCHAN ignited our Gift of “Knowing.” We can do it with our eyes open. The Magic of everything we can do is the Jaguar’s Wisdom of Gratitude. Be grateful NOW for what you can’t see in the future, but Know will come to pass – because now we’ve seen Miracles before. Dream of a Miracle and be Grateful for the Dream. CIMI resides in the North, the direction of Wisdom – the collective Wisdom of all Human experience, the Wisdom spoken in childlike Innocence, and the Divine Wisdom of the Ascended Ones and the Creator. North holds the Element of Air, the Sacred Breath, and the element that relates to our Mind and faculties of thought. CIMI can change our mind and the way we see things. This is a trecena for holding an Open Mind. Through a Divine Perspective, we’ll know that everything is Perfect for this Time. Tomorrow the Wayeb begins where we’re left at home alone for the first time. No Year Bearer is in charge. What choices will we make? The Wayeb will show us what we’ve learned and our own ability to stand on our own. Making mistakes, like humans usually do, we’ll end up with a different perspective of the ones who showed us a way. We’ll know it wasn’t as easy as it looked… with all the human choices we’re given and all the stuff in front of us that we could have right now. Our parents always pushed the things we wanted to a future day. Today is a day to prepare for Tomorrow. The snow is still on the ground here. I climbed the hill out of here yesterday for the trip to the corner for provisions. This is a time like that to prepare for the Provision of Family. Just imagine that you’re turning a snowbound experience into a family party – an excuse to stay home from school and be together. Jen tells me that in Guatemala, they stay home, but they also check in on the neighbors next door and share any provisions that are needed. CIMI illustrates Death to remind us that something always dies when something new is born. We die to an old way to take on the new. To all my relations, may we round up our Provision of Love. May we see beyond the teenage ways in all of us, to see an Intention of standing on our own two feet. May we look around at the family and see where someone in chaos needs to know that someone else believes and sees the future. May we prepare so that when others turn to us, we will be a comfort. May we REALLY LISTEN to each other, not passing off the fears as an illusion, but Acknowledging that the chaos has a Divine Meaning and Purpose. May we cleave to each other as the human chain and know that every Member of the Circle is a link that holds all of us together. No link is more important than another. May we Kneel in Humility of our own limitation, and give thanks for a Love that will be Created, Knowing it’s already part of the plan. PS. We’re bound to run in to some of our odd relations. We have to Love them just as much and forgive for the monkeys we all are – just doing the best we can. I’m grateful for Unconditional Love we will know that is greater than the Love we know today, and grateful it’s made possible by each other. Our candles burn for Don Alejandro, reflecting the Light he shared with us. May we send the Grandfather Tata, our Love and Light. Don Alejandro is bed-ridden at 90 and we’re holding watch. A contact email for a donation to help cover his medical care is included in the Update on Don Alejandro’s health shared by his dear friend Joseph.